Last week my daughter Jordyn and I spent her spring break touring college campuses. On Tuesday morning, we jumped on a Southwest flight to Raleigh, North Carolina to tour the University of North Carolina at Chapel Hill. The city was quite charming and picturesque. The admissions director did an excellent job of reviewing the facts about getting into North Carolina. His Power Point covered everything from standardized test scores to the percentage of out of state applicants accepted. Just about anything you’d want to know about the school was answered. The second half of the tour was led by a student ambassador. As we walked the grounds, our guide touched on the history of the school and was able to weave in stories about the type of educational opportunities available at the school. If she couldn’t draw upon her personal experiences, she used anecdotes from her friend. She did an excellent job of selling the school and the sense of community there. My favorite part was walking through the “pit” (student center area) and watching a group sing acapella. Overall, Jordyn was quite impressed with the school, its students and educational opportunities. On Wednesday we toured Vanderbilt. The experience was nearly the same. Beautiful campus, great representative from the admissions office and an excellent student tour guide. On Thursday we flew into New Orleans early to tour Tulane. I drove Jordyn straight to Café du Monde for her first true beignet experience. We then spent some time walking through the French Quarter before settling down at Felix’s for a fix of raw and chargrilled oysters. Jordyn has friends at Tulane and was looking forward to falling in love with the school. Unfortunately, though Tulane matches UNC and Vanderbilt in cost, it fell way short on the tour. I don’t want to get into slamming Tulane in this blog, but suffice to say, it didn’t even come close to meeting our expectations. The city of New Orleans gets two thumbs up, but Tulane won’t be making Jordyn’s cut. To really prosper with catering, you will need to be able to present yourself and your company. Whether it’s face to face at a tasting or in front of a large decision making committee, your sales presentation will make a difference. Yes, the quality of your food is important, but your prospect is also buying “you”. From how you are dressed, to the words you use, make sure you are prepared to answer questions that may be asked and touch on hot buttons. Then be quiet and listen. Knowing a prospect’s hot button gives you some powerful ammo. I once asked this question to land a ten thousand dollar event. The committee let me know the caterer at their last event ran out of food; embarrassing the plant manager. I let them know about our 120% Catering Guarantee and walked away with the job…and we were coming from two hours away! A great way to improve your sales presentation is to mystery shop your competitors. You’ll pick up ideas and identify their weaknesses. Making sure you improve upon their weaknesses will make you a sales champ! Frankly, I am surprised Tulane hasn’t done that. All it would take would be mystery shopping some of the top twenty schools to better their game. Another way to better your game is to record and listen to your phone calls. 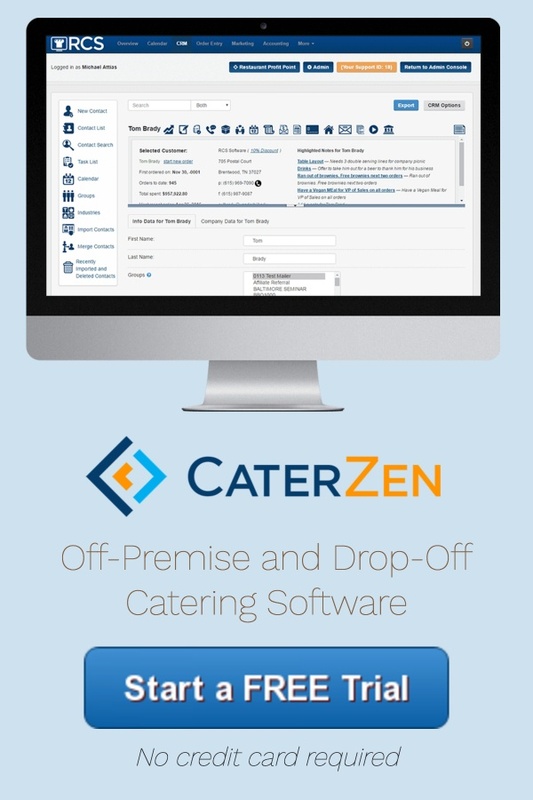 RCS catering software has the ability to record all incoming and outgoing catering calls. If you can’t be objective, hire someone to give you pointers. In no time, you’ll sound like a pro and increase your closing percentages. 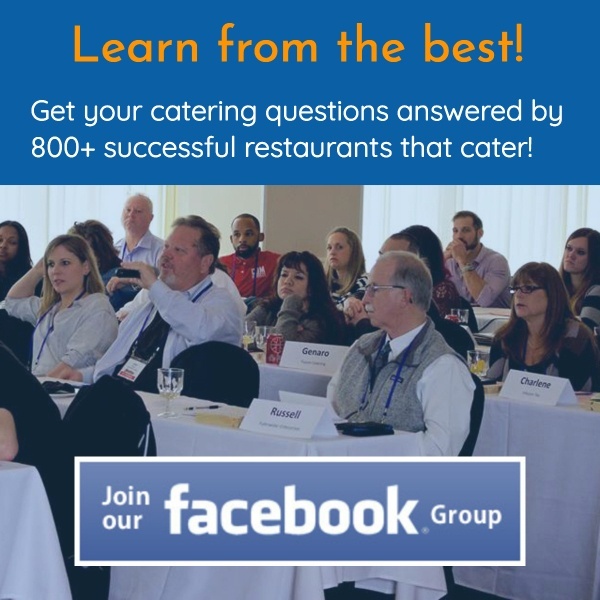 DOUBLE NOTE: Last year I put on a full day catering seminar in Baltimore with one of my most successful clients and longtime member, Frank D’Antona with Cantina Mamma Lucia in Baltimore, Maryland. We had to turn people away last year.